Figure A-1 displays the data that was dumped into a Microsoft Excel worksheet from an SQL Server database. The workbook file named WarrantyCounts.xls is located in the Appendix A folder on the companion CD-ROM. This file contains approximately 1,5000 rows of data that would be difficult to summarize if it weren't for the built-in Excel PivotTable feature. Once you have the data, it's time to create your first PivotTable report. The easiest way to create this report is with the PivotTable Wizard (accessed from the Data menu). Before starting the wizard, select any cell anywhere in the data range. This will cause the data range to be automatically selected by Excel. When you choose Data | PivotTable and PivotChart Report, the Pivot Table Wizard - Step 1 of 3 dialog box appears. 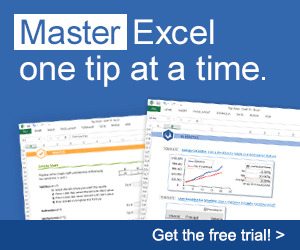 Choose the source of your data (Microsoft Excel List or Database) on this screen and click the Next button. 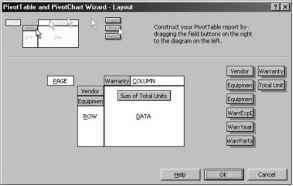 The PivotTable Wizard - Step 2 of 3 dialog box appears. Ensure that the range displayed in the Range field incorporates all the data on which you want to report. The range will appear automatically if the active cell is within the data range. If the currently selected cell is outside of the data range, you will need to make your own selection. of 3 dialog box, you will see a PivotTable layout, as shown in Figure A-2, that explains how to place required fields in the pivot diagram. ■ The Row area should contain the fields that you want to display your data "by." For example, if you want to produce the report by Vendor, place the Vendor field in the Row area. The Row area can contain more than one field. In our example report (see Figure A-3), we also want to see the report by Equipment Type, so the Equipment Type field is placed in the Row area as well. If you position the Equipment Type field to the right of the Vendor field, the data will be grouped first by Vendor and then by Equipment Type within those vendors. ■ The Column area should contain fields that answer the question "what." For example, what type of information do you want to display for each of the fields in the Row area? Our example PivotTable reports on the Warranty type. Because we want to see all types of warranties for each vendor and equipment type, we placed the Warranty Type field in the Column area. However, if you want to view your data from a different perspective, you can place the fields from the Row area in the Column area and vice versa. It is up to you. ■ The Data area displays the data that you want to analyze. In our example, we want to find out the total number of units (Equipment Type) covered by each of the Warranty types. The Data area must contain a field that has numeric data. Once we place the field containing numeric data in the Data area, we can choose what calculation (sum, count, average, and so on) we want to perform on the data. PivotTable by the Equipment Id or show the data for all the equipment. Later in this appendix, when you generate a PivotTable programmati-cally, you will add a field to the Page area and be able to experiment with the data. Note that you do not have to place all the fields in the PivotTable. Place only those fields that you need; you can easily add other fields at any time via PivotTable toolbar buttons or a shortcut menu. If you position the fields as shown in Figure A-2 and press the Finish button in the PivotTable Step 3 of 3 dialog box, you should see a PivotTable report, that resembles Figure A-3. M fx Sum of Total Unit? PivotTables are for data analysis and presentation only. This means that you are not permitted to enter data directly into a PivotTable. To make any changes or additions to the data, you must do this in the underlying source data and then use the Refresh button on the PivotTable toolbar or the Refresh Data option on the Data menu to bring the PivotTable up to date. To see new versions of the same information, drag PivotTable headings to new positions. Figure A-4 presents a different view of the same data. You can examine the contributing data by double-clicking a cell containing a total. For example, if you double-click cell C8 (Figure A-3), Excel will add a new worksheet to the active workbook showing all the records that contributed to the selected total value (Figure A-5). Figure A-5: You can obtain details of any summary figure by double-clicking on a data field in the PivotTable. Drilling down on the data is a nice feature, except for the fact that if you do a lot of double-clicking, you will end up with many additional and most likely unwanted worksheets in your workbook. You may want to delete the drill-down worksheet after examining the detail data. You can do this manually, or you can perform the cleanup programmatically by writing VBA procedures for the Workbook_SheetBeforeDoubleClick and Work-book_SheetActivate events. To try this out, switch to the Visual Basic Editor screen and double-click the ThisWorkbook object in the Project Explorer window. In the Code window WarrantyCounts.xls - ThisWorkbook (Code) window, enter the global variable declaration and event procedures shown on the following page. The Workbook_SheetActivate event procedure shown above will ask the user whether the drill-down worksheet should be deleted when the user returns to the worksheet containing the PivotTable. If the user answers "Yes" in the message box, the Boolean variable flag will be set to True. Because Excel by default displays a confirmation message whenever the worksheet is about to be deleted, the procedure code turns off the application messages so that deletion can be performed without further user intervention. After the deletion, don't forget to turn the alerts back on. The Workbook_SheetBeforeDoubleClick procedure shown above will disable the drill-down if the user clicks on a PivotTable cell that is empty; otherwise, it will set the Boolean variable flag to True to indicate that a drill-down was requested. At the same time, the name of the worksheet containing the PivotTable will be written to a global variable. Also, because we do not want to delete the worksheet containing the PivotTable source data, we will use the SourceData property of the PivotTables collection to store the name of the source data worksheet and the underlying data range in a variable. To find out exactly how these two event procedures work together, use some of the skills that you acquired in Chapter 13. Wow! Fantastic work. Can you give me some tips to create another one please? Thanks mate!